2735 DUPLO Curved Track is a DUPLO train set that was released in 1993. 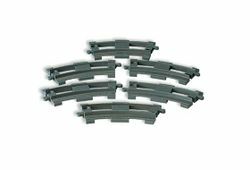 The set contained six curved train track pieces to go along with other DUPLO train sets. Interestingly, the set was re-released in 2002 under the Explore Logic theme. Facts about "2735 DUPLO Curved Track"
This page was last edited on 9 January 2016, at 06:15.